The first three quarters or so of this weekend’s IAAF World Half Marathon Championships in Valencia, Spain, were cagey and uneventful, as the runners hung out and watched each other while being buffeted by powerful gusts of wind. 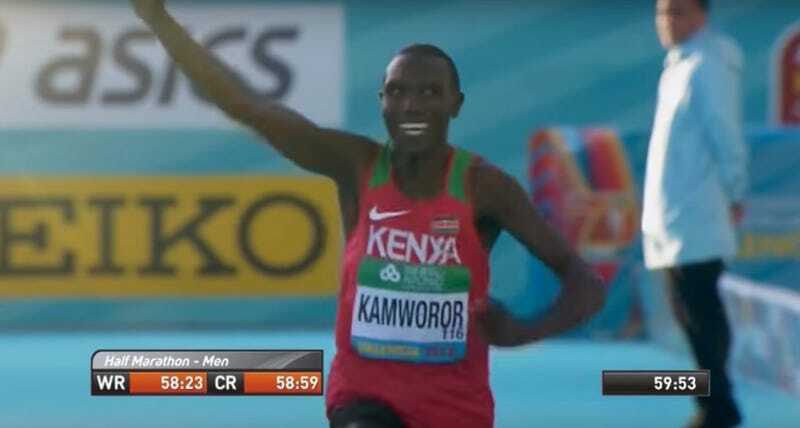 Then, with about six kilometers left to go, two-time defending world champ Geoffrey Kamworor took off and put together one of the most impressive finishes you’ll ever see in a distance race. 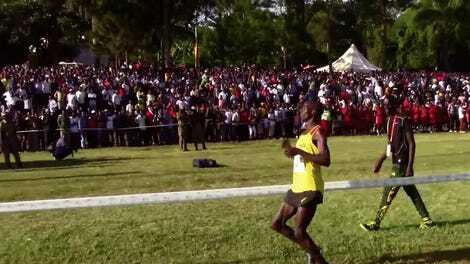 Aided by a tailwind, Kamworor split a 13:01 5k for the final 3.1 miles of the race. He probably wouldn’t have been able to go that fast without the help of the wind and the strategic start, but those are minor quibbles when you consider he cranked out a time which would have won gold at the 2016 Olympics at the end of a half marathon. LetsRun notes that he went at a 4:10 mile pace over the final 6.1 kilometers—a little less than four miles at the end of a 13-mile race. Kamworor ended up winning by 20 seconds in 60:02; he decimated a field comprised of some of the world’s best long-distance runners. Kamworor, the winner of the 2017 New York City marathon, has now won three straight half marathon world titles, and the last two in impressive fashion. In 2016, he fell and was trampled at the start, only to win in 59:10. He also took the 2017 cross country world championship with a spectacular finish. The dude only races thrillers.